Delegate Lee Carter Hates the Amazon Deal. We Asked Him Why. 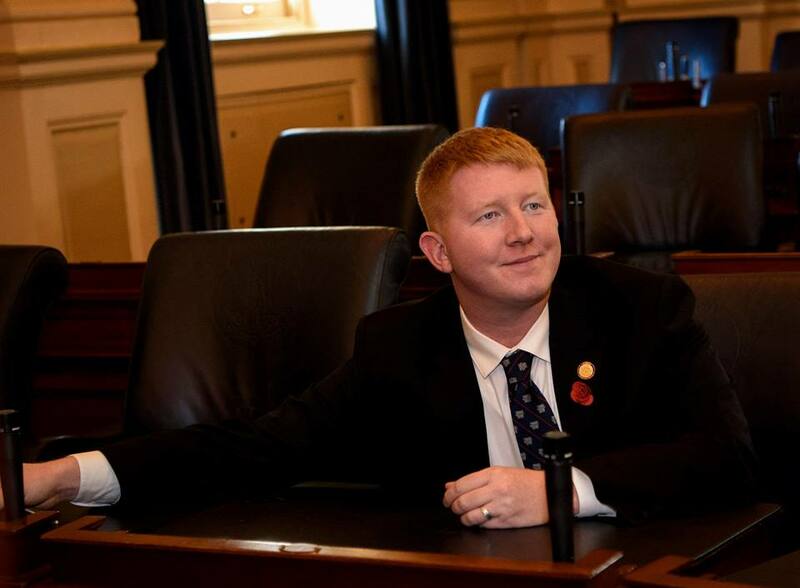 Delegate Lee Carter (D-Manassas) made national headlines in 2017 when, running as an open socialist and member of the Democratic Socialists of America, he upset the then-majority whip and won election to the General Assembly. Despite mockery from Republicans and members of his own party, he seems to relish his status as the de facto poster-boy of the Left in the Commonwealth. Most recently, that meant coming out against the deal that would place a new Amazon headquarters in Northern Virginia, something most politicians have celebrated. RVA Magazine caught up with Carter to hear more about his problems with the Amazon deal, his thoughts on the midterm elections, and his reaction to seeing asylum seekers tear gassed by federal authorities. You’ve been vocal in your opposition to the Amazon deal. The State Secretary of Finance says this deal holds “zero financial risk to the Commonwealth,” and the state estimates a net return of $3.2 billion dollars and 25,000 new jobs from this deal. That’s a ton of money and a ton of jobs – how could that not be good for Virginia? Well, I think they need to remember that we don’t represent a tax base. We don’t represent a line-item on a budget. We represent real people who have real lives, and this is going to massively increase housing costs in Northern Virginia. Northern Virginia is an area with very low unemployment right now. We don’t have a joblessness problem – we have an affordability problem. In fact, we have more people than jobs. We have people working two or three jobs just to make ends meet. So piling more jobs onto that is not only not going to make it better, it’s going to make it worse, because you don’t have anyone here to fill those jobs. You read the memorandum of understanding between VEDP [Virginia Economic Development Partnership Authority] and Amazon, it’s pretty clear that transfers count as a new job under this deal. Amazon can just move people in from Washington State. They can move people in from across the river in Maryland. And that counts as a new job. That’s one more person fighting for the same amount of housing. It’s going to drive housing costs way up, it’s going to displace people out of their homes, and it’s going to make life worse for quite a lot of people in the Commonwealth. So why do you think it is that so many politicians are wooed by the idea of high-paying jobs and all this money that’s going to be injected into the economy? Because it’s easy politics. I’ve got to admit – it’s hard, going out on a limb, standing out there and saying, “No, we don’t need more jobs.” There’s this conventional wisdom that says “More jobs magically fixes everything.” That’s not what we need. We need the jobs we have to pay better. Another selling point is a promise from Amazon to fund new higher education programs and expand others at Virginia Tech and George Mason. They’re going to be bringing tons of opportunities for computer science education to Virginia – isn’t that going to help people? They can say what they want – it’s not in the memorandum of understanding. The transportation project that people are touting? That’s going to have to be state money, because it’s not in the MOU. The new campus for Virginia Tech? That’s going to have to be state money, because it’s not in the MOU. On and on and on down the line, the only thing that Amazon has to do to get the money is just “make jobs.” But again, they can just transfer people in. And the absolute worst thing in that contract is there is no escape clause for the Commonwealth of Virginia, but Amazon can cancel it on five days’ notice for any reason and keep every penny that they’ve gotten up to that point. There is not a single lawyer in America that would let their client sign that contract. So what makes you wary about the government working so closely with a corporation like Amazon? You don’t have to look any farther than what’s going on with GM right now. GM is talking about closing down a number of plants around the country. One of them, the Detroit-Hamtramck Plant? Thirty years ago, Detroit did the same thing for GM that we’re doing for Amazon right now. They displaced thousands of people. They funneled GM tons of public money on the premise that GM would bring jobs and revitalize downtown communities. The jobs never materialized in the kinds of numbers that were promised. There was no benefit for the communities around the plant. And now the plant’s closing, and they’re going to have an empty factory for who knows how long. Virginia’s seen as a moderate state, and the Democrats there are mostly “pro-business” Democrats. How do you convince a Warner or Kaine, Clinton or Northam voter that this project is going to be a net negative? It’s not something theoretical. The easiest way to convince people this is actually a bad deal for us is, first, have them read the memorandum of understanding. There’s a lot of lawyers in the General Assembly – not one of them would be OK with that escape clause. Second, the reason Amazon is expanding outside of Seattle is because Amazon’s presence in Seattle has made Seattle unaffordable. This is not a theoretical thing. It’s not charts and graphs. It’s, literally, look at what happened in Seattle. The good, paying jobs in Seattle don’t pay well enough anymore, even if it’s $150,000 a year, because Seattle’s so expensive it’s not worth it to move there for $150k a year. Alexandria Ocasio-Cortez and a few other socialists have also come out very strong on this issue. How do you feel about the Left’s chances in the fight against Amazon? We’re taking on the wealthiest man that’s ever lived. That’s something to keep in mind. Not just the wealthiest man right now – literally the wealthiest man that’s ever lived. There’s more of a disparity between Jeff Bezos and the average American than there was between the Pharaoh and the average Egyptian. It’s going to be a hard fight. Anything else you’d like to say about Amazon or Jeff Bezos? Yeah. The reason that I’m so vocal about this is not just fighting for my constituents – I’m fighting for myself here. Delegates don’t get a very high salary, and Manassas is not a cheap place to live. So, my rent’s going to go up. I’ve got a one-bedroom apartment by the train station, the train that basically goes straight from my apartment to the new Amazon headquarters. I’m in the same boat as thousands of my constituents. A staple of your first year in office has been your willingness to mix it up on Twitter and have debates with your opponents. Is this how our politicians should be acting, getting into fights on social media? The big thing here is, politics is not some theoretical, some abstract where you get points for good behavior even if you lose. Politics is the business of making decisions about who can eat and who can pay the bills. If you’re not willing to mix it up, if you’re not willing to go out there and throw some haymakers to make life better for people, you’re in the wrong line of work. So you’re saying it’s OK for politicians to actually identify and call out their enemies? How are you feeling about the results of the midterms? It’s a mixed bag. My wing of the Democratic Party gets put in this position where the national party really only lets us run in races where they think nobody could win, ever. So that’s why you see people going out on a limb in Georgia – in a statewide race in Georgia, going out on a limb and actually standing on principles and making clear, convincing, moral arguments. You know, the conventional wisdom says that if you’re in a hard state, you’ve got to go right, you’ve got to pretend to be a Republican. It didn’t work too well for Joe Donnelly, it didn’t work too well for Heidi Heitkamp. Somehow it worked for Joe Manchin – I don’t know, he’s got some kind of voodoo magic that I don’t understand. But by actually going out there and making moral arguments to voters and fighting back against corporate power, we put Georgia and Texas in play. Yeah, I was surprised by a lot of the takes about how Beto failed, or how Stacey Abrams failed to win in Georgia, because it’s like, when was the last time we were even having conversations about winning these races? Right. And I have my problems with Beto on policy, but he did do a good job of going out there, saying, “I’m not taking corporate money. I’m going to fight for what I believe in.” Just pure campaign strategy. He ran the kind of campaign that folks on the Left would like to run, and he put Texas in play. For a year there, you were basically the only visible and open socialist legislator out there, other than of course Bernie Sanders. Is it nice to know, going into the next legislative session, that that will no longer be the case? I was not the only socialist state legislator – there was also one guy in Maine. Going into the 2018 legislative session, we went from one socialist state legislator in the country to two – it doubled when I got elected. Now we’re up to, what is it, a dozen, two dozen, somewhere around there? People going out there and making a strong critique of our economic system, saying that we need radical transformation of our economy from one that serves the interest of billionaire investors to one that serves the interest of working people – that’s something that is expanding exponentially. We’re starting from zero, but there’s nowhere else to go but up. Do you think we might be approaching a watershed moment, in terms of having enough socialists in government that people are forced to reckon with it? Absolutely. And it’s not the first time in American history that this has been the case. From the 1890s to the 1940s, you had socialists at every level of government. You had state legislators. You had, especially, municipal socialists. It was a fact of American life. There were three major anti-capitalist parties in the United States: the Socialist Party of the United States, the Socialist Workers Party, and the Communist Party of the United States all had elected officeholders until the McCarthy period of the 1950s. So this is not new, it’s a reversion to the mean. Before we wrap up: as a former Marine, how did you feel about the soldiers that were dispatched to the border, the panic around the “caravan,” and the fact that it dissipated magically after the elections? The folks that were trying to come here are victims of U.S. foreign policy. We have overthrown governments in Latin America left and right, for longer than anyone in America has been alive. How many times did we invade Nicaragua in the early 1900s? As a country, our leaders have always thought of Latin America as a playground for the U.S. military, and there are real human victims on the other end of that. To militarize the border, to tear gas people in another country who are just trying to come here so they can live in a place where their kids won’t get shot – it’s horrifying. As a veteran, what would you say to the men and women in the military who are being asked to carry out orders like that? Right now, the military personnel are sort of just down there doing logistical stuff. It’s Customs and Border Patrol that have been firing tear gas. But the U.S. military teaches that if you receive an unlawful order, you have a duty to not obey it. There are laws regarding the use of tear gas. You can’t fire it at civilians in another country. It’s the law. Obey the law, that’s my message – obey the law around not using tear gas on civilians in another country.